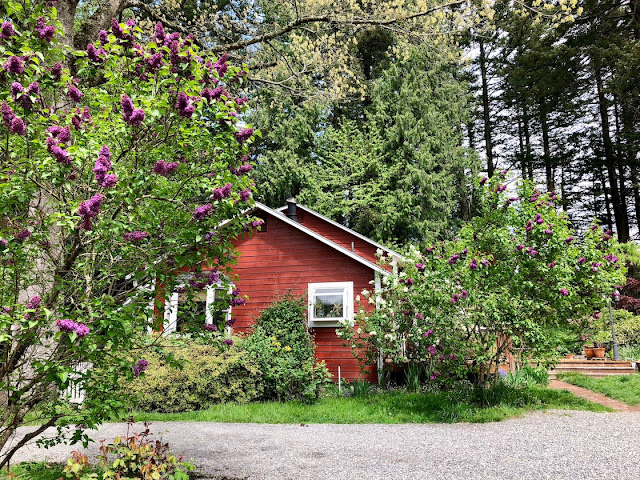 This old farm place is blooming it's heart out right now. 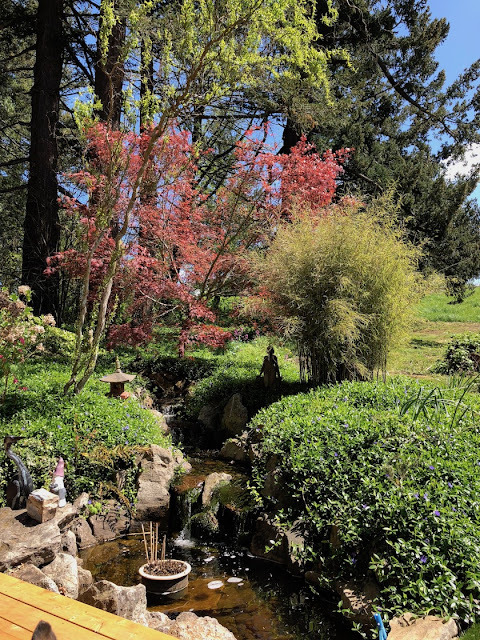 Spring is pretty wonderful here. I found a white Lilac leaning across the back of the newly painted red house and loved the way the colors popped. 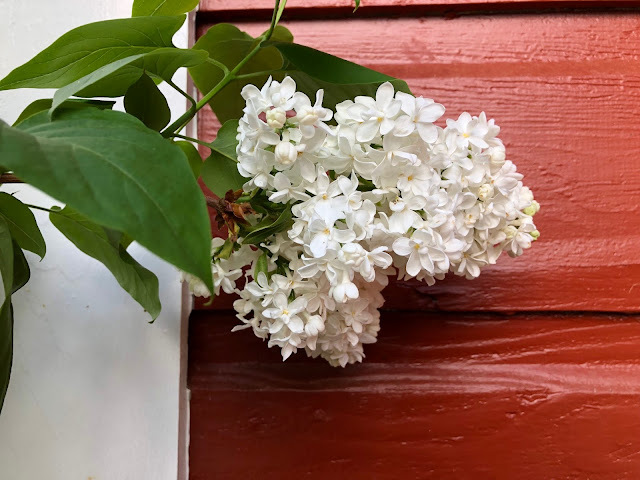 I planted the white one right by the deck and under the garden window just so the aroma of the flowers would be waft into the house. It sure does smell good around here right now! I had to go down into the pasture to capture the old pear trees in bloom. 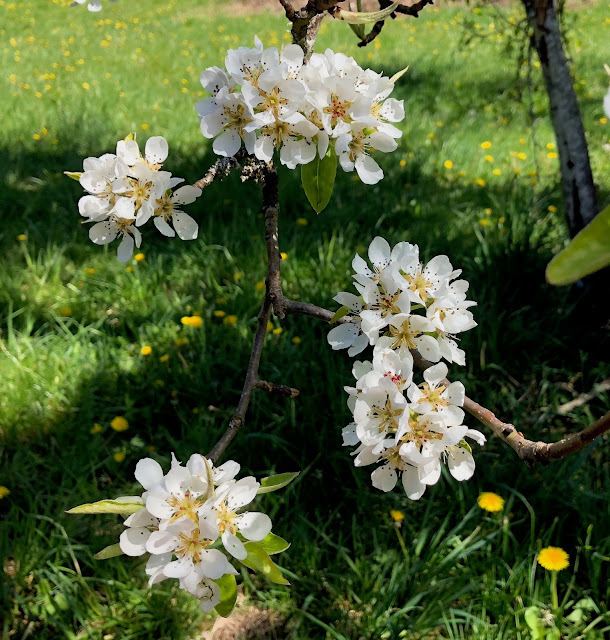 I do love fruit tree blossoms. 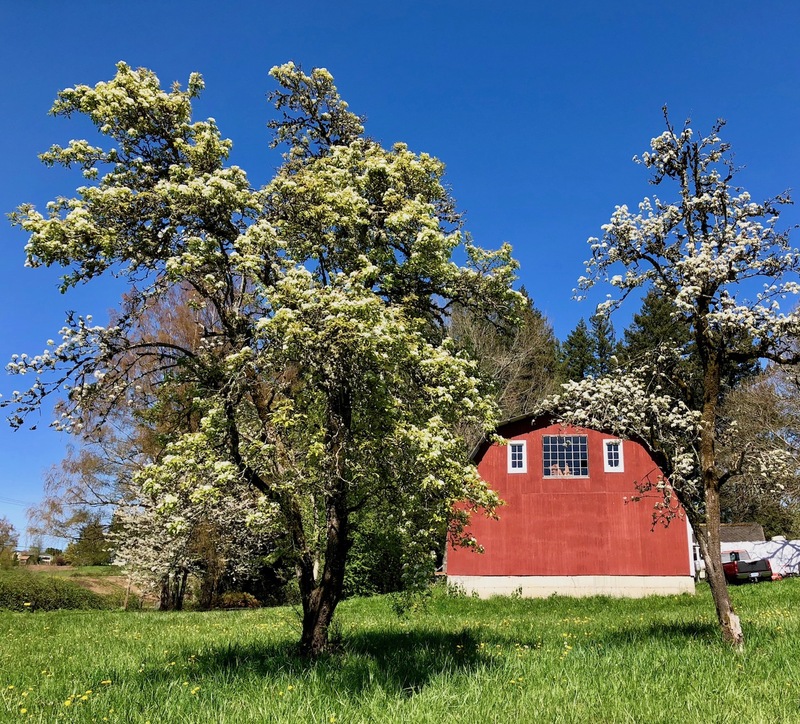 Kristi and Travis were given a lot of fruit tree starts from her mother and recently dug a LOT of holes and have added to our orchard - cherries, peaches, pears and many more. 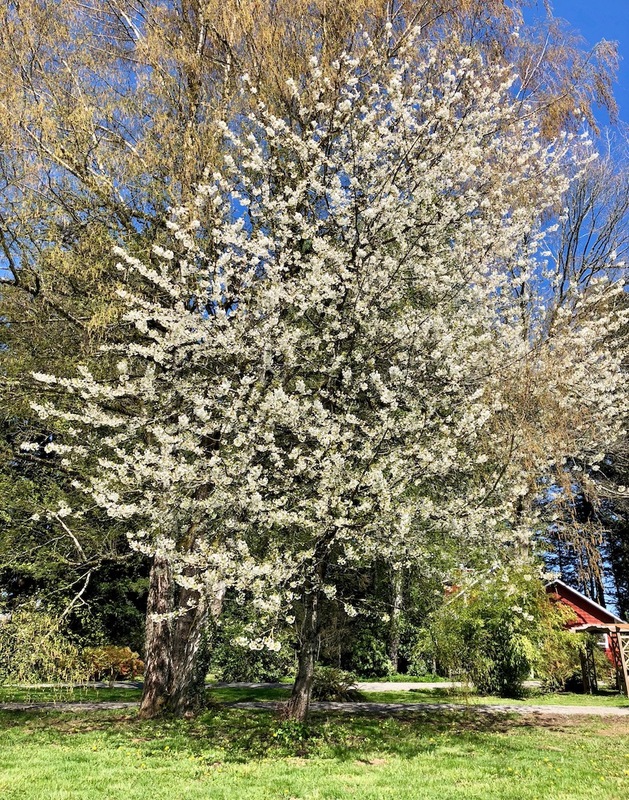 The pear trees are different varieties, Anjou and Bartlett. We now have an Asian pear. 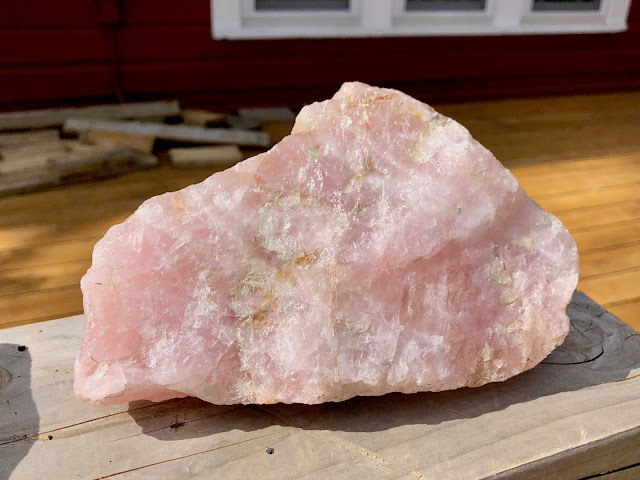 I brought my new chunk of rose quartz into the kitchen and scrubbed it with dish soap. It looks prettier now! 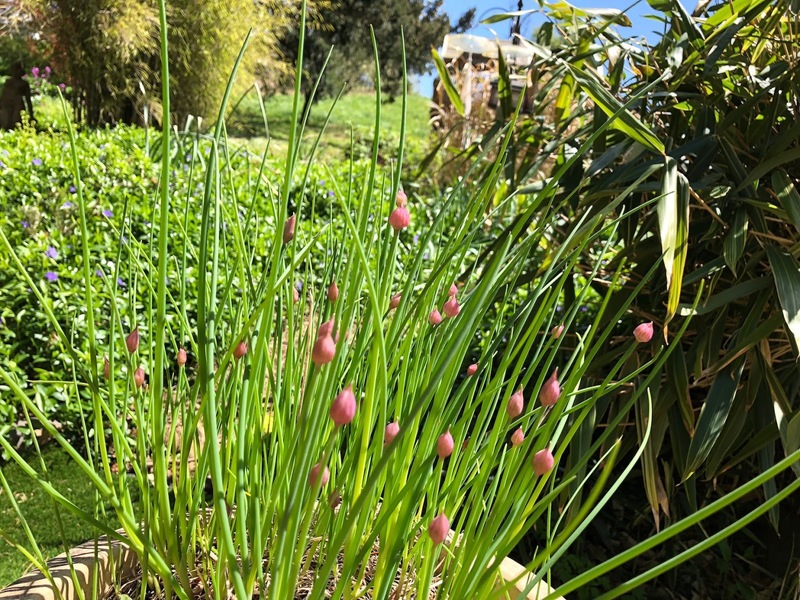 We have 2 pots of chives that come back every single year and thrive. I can highly recommend having a pot of them yourself. 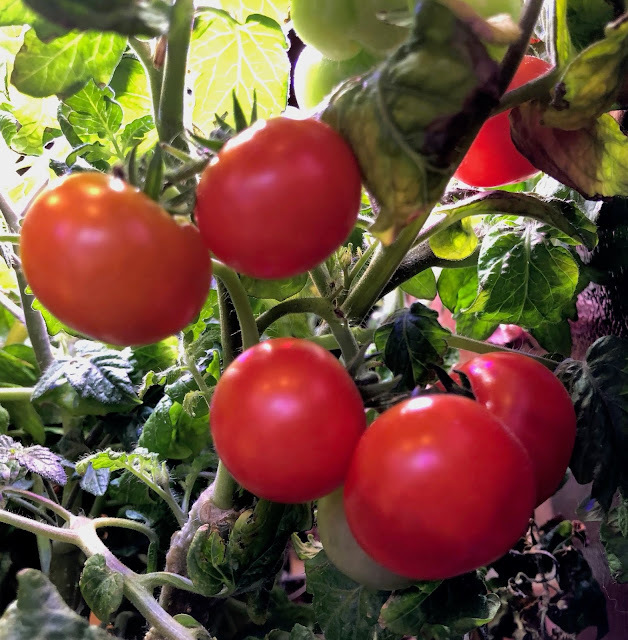 And look at the cherry tomatoes Kristi grew in the little kitchen hydroponic garden! The bleeding heart is performing well as always. 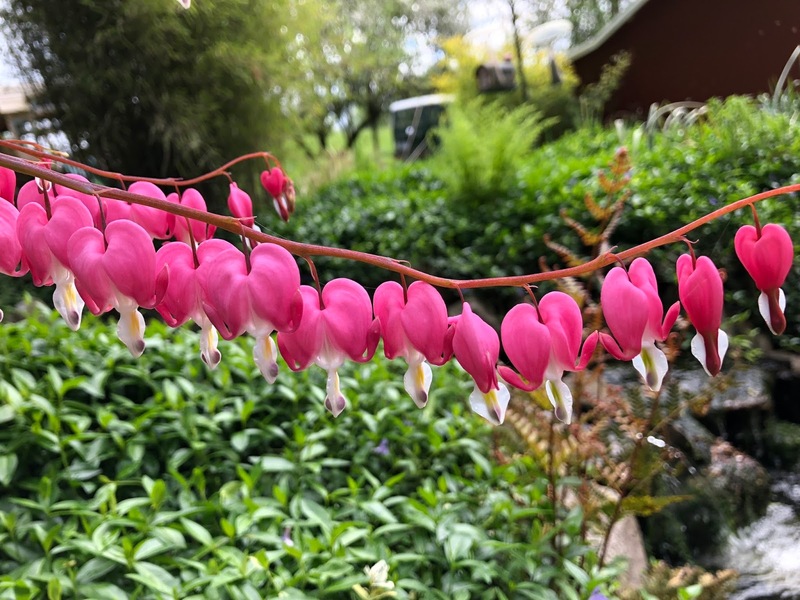 These really are amazing flowers, don't you think? 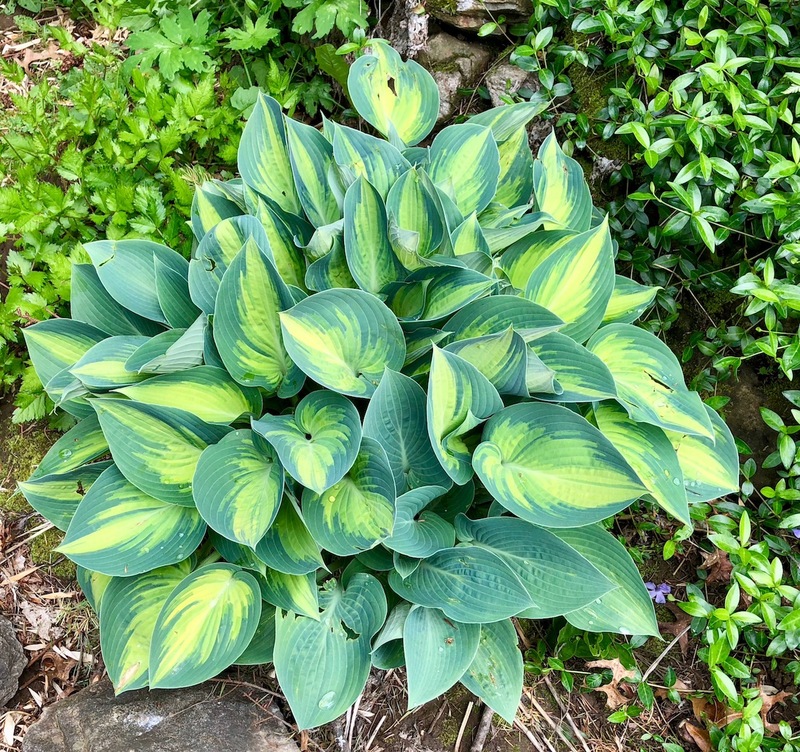 We have several Hosta that are happy with the rainy weather we've had. 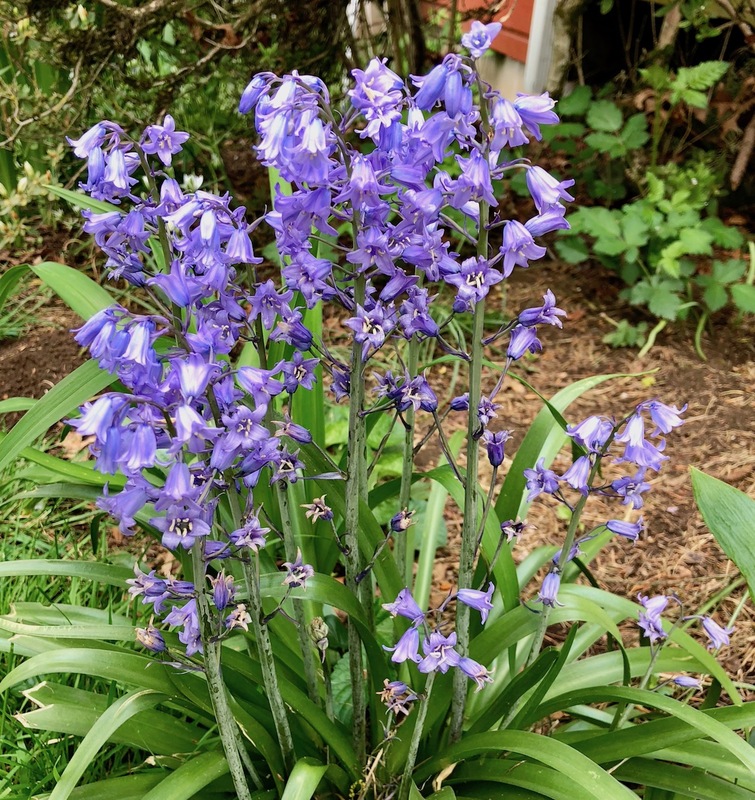 And we have ONE Bluebell plant that comes up each year. And it's a banner year for my Lilacs - this is a French dark purple. I have 2 dark purple, 3 common lavender, 1 white and now I have a pretty feathery pink one AND a purple with white edging. 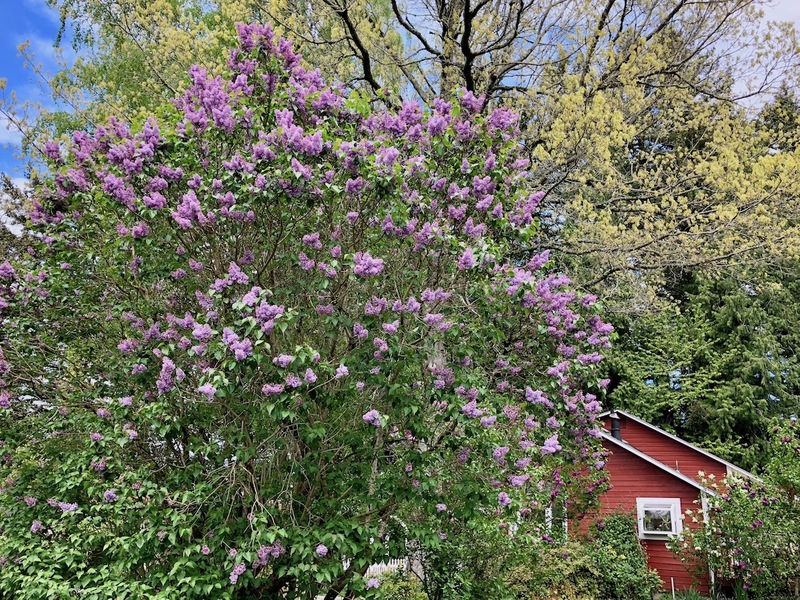 This is the massive old 20 foot tall Lilac that was here when we moved in the house in 1984. 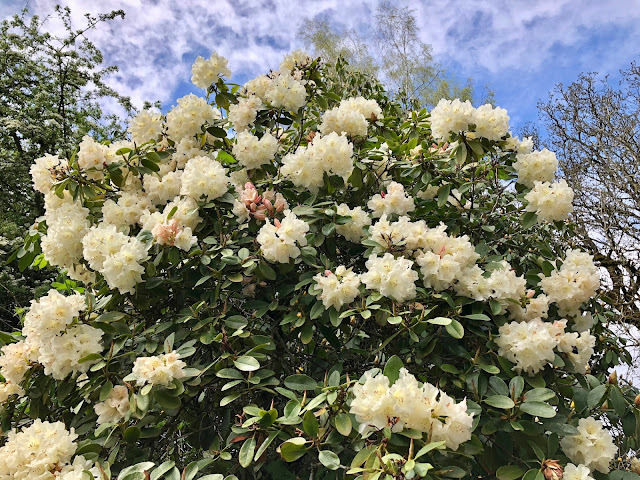 This creamy white Rhododendron is also huge, I will take more photos of the other ones in bloom for my next blog post. The flowers on the old lilac. I sure wish you could smell it out there right now! 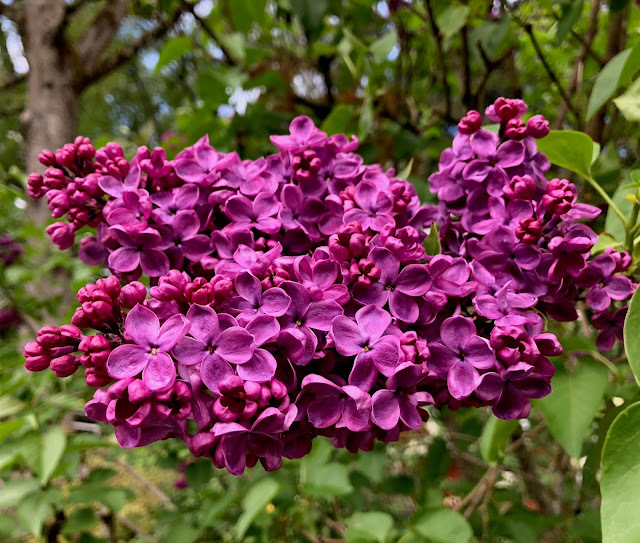 So beautiful - I love lilacs. Ours are just starting to open up here and our Hosta is just now breaking ground. Spring is late for us but things grow very fast. Am harvesting asparagus daily in our orchard and the rhubarb is ready to start picking. Oh all those beautiful blooms...I can almost smell them. I love the red barn..red is my favorite color and I don't hardly every see red barns in my neck of the woods. The only flowers blooming here are my roses and clematis. I've not done much gardening lately. I agree, the lilacs are stunning this year. Thanks for showing yours. Your spring is gorgeous! Ours is showing a bit of color. It seems late in arriving. What a joy to visit and take a tour of your beautiful garden. A feast for the eyes and I can only imagine the beautiful aroma. 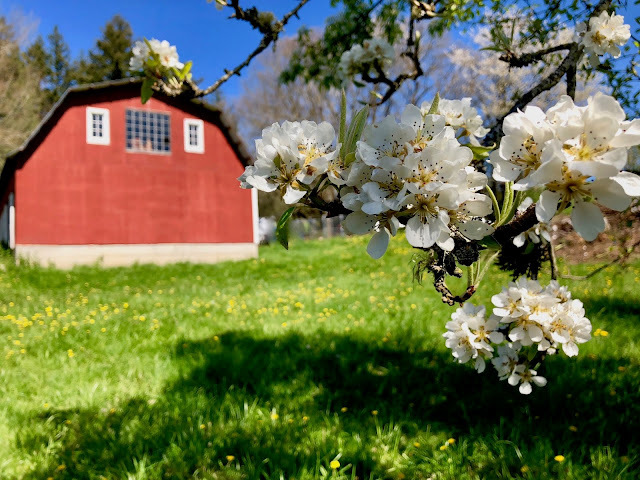 I always love to see the blooms around your farm. There are so many and alway slovingly tended. I do love lilacs. 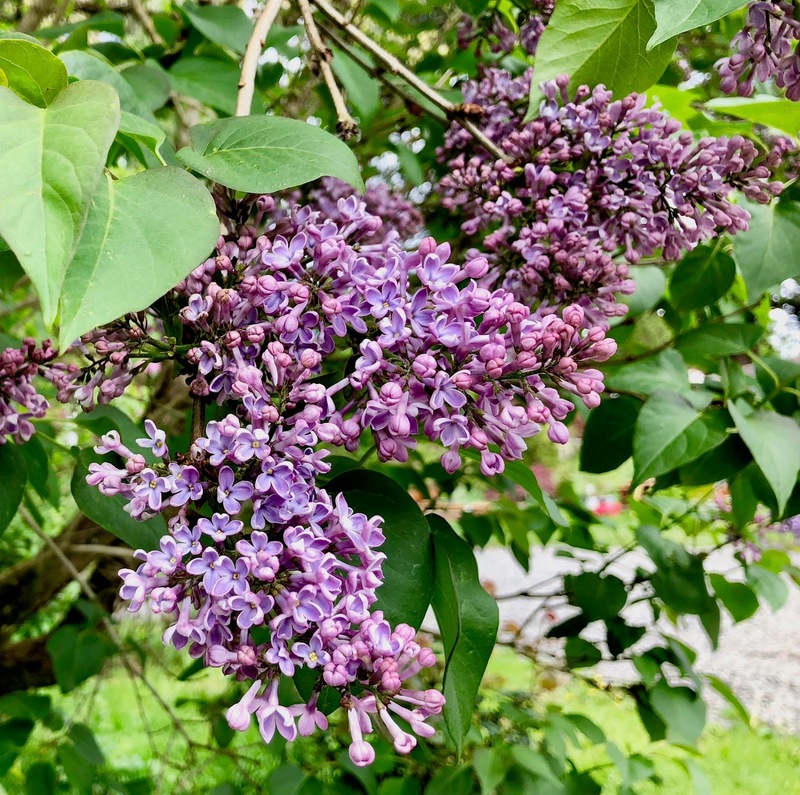 You know Spokane is called “The Lilac City” and ours around town have just begun blooming in the past few days. They are gorgeous. Thanks for sharing the beauty of your home with us. Teresa, your property is so beautiful! I love seeing all your flowering plants. Asian Pears are so good! Mailing's company has an Asian Pear Farm and although it is not open to the public, we were able to tour it last year. I can smell your lilacs!! LOL My one lilac bush brought down from Vermont is not doing all that well this year. Only a very few blooms. I think some kind of vine is choking it - Fletch has been reminded to cut the vine out!! 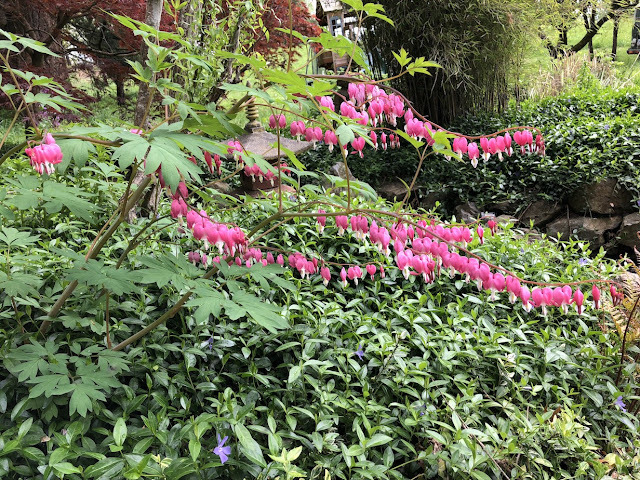 And bleeding hearts - so lovely and I have not had luck with them! I had not realized that Dayle built your beautiful barn single-handedly. Wow! impressive barn Dayle! love those vintage crocheted pieces! 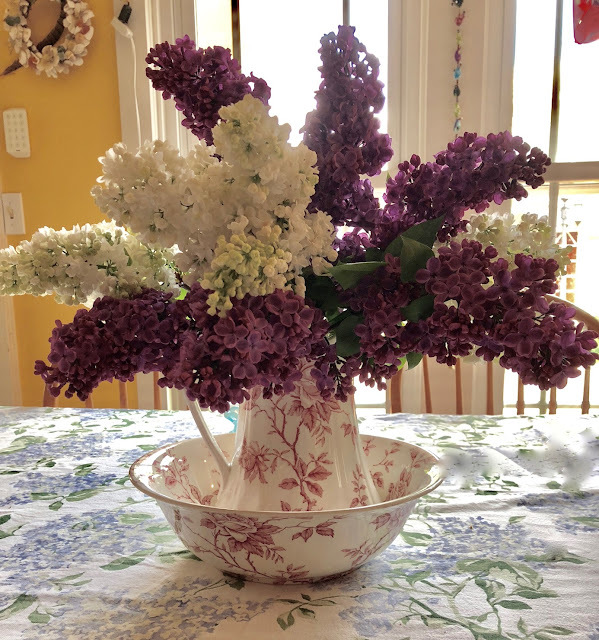 glad Kristi went to the attic:)love the smell of lilacs too. 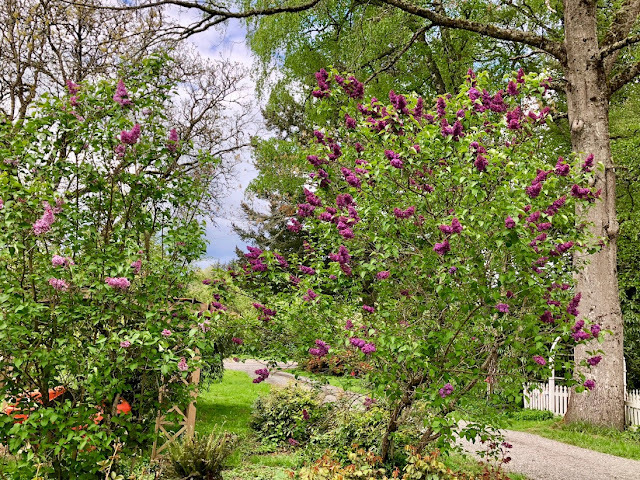 Your yard is so lovely and the lilacs really made my day! Thank you for taking such lovely photos and sharing them with us. Thanks for sharing those blossoms one and all! 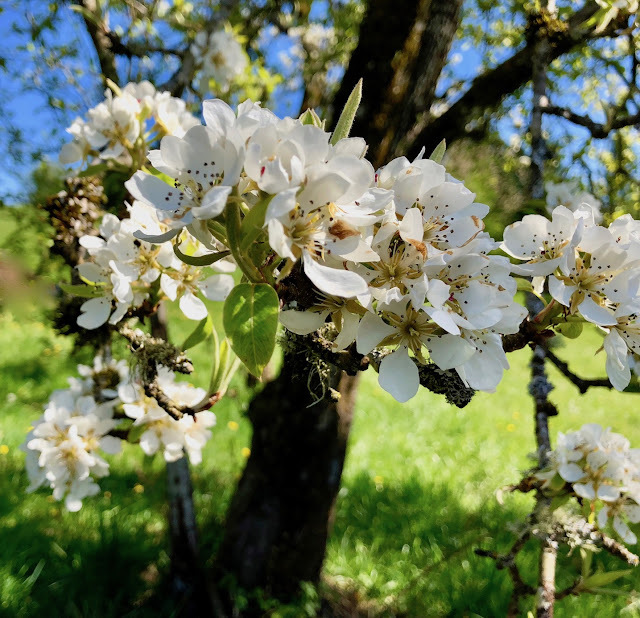 We are a bit behind you but the apple trees are beginning to blossom. The lilacs have just leafed so no flowers yet. BUT! my clematis , all 3 came back and 2 of 3 have blossoms coming! I love the scent of lilacs, they remind me of being a little girl in my granny's garden in south London. I wish I had a garden big enough to grow one - I wonder if there are miniature versions that would do well in a big giant pot? My goodness.....the farm is stunning in Spring!!! Wow! !